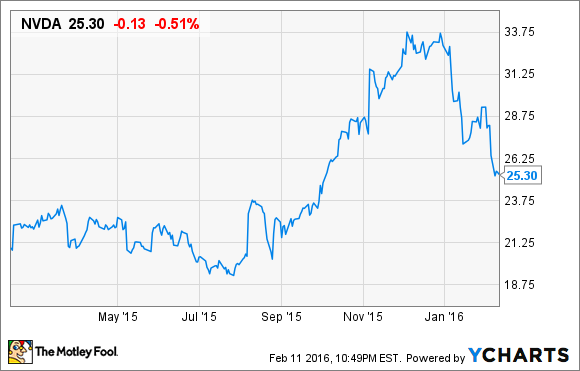 Can NVIDIA Corp. Avoid the Broad Semiconductor Weakness? This chip-maker is better positioned than most PC-exposed semiconductor companies. Visual computing specialist NVIDIA (NASDAQ:NVDA) is a company that derives much of its revenue from sales of components into PCs. However, what has been and continues to be a unique aspect of the company's business is that its products aren't aimed at mainstream PCs, but rather at PCs aimed at gaming and other graphically intensive functionality (such as workstations). This has allowed NVIDIA to do quite well even in the face of weak industry demand for personal computers, as the sub-segment that it serves within the PC market is actually quite robust. That being said, NVIDIA's share price has not been immune to the broad decline in shares of just about every publicly traded semiconductor company. Many chip companies are blaming muted end product demand as a result of a tough macroeconomic environment for revenue, and NVIDIA shares have been collateral damage as a result. The company is slated to report its financial results on Feb. 17, or less than a week from this writing. In this column, I'd like to go over what investors are expecting from the just-ended quarter and from the company's guidance for the coming quarter. Analysts are currently looking for NVIDIA to generate $1.31 billion in revenue for the quarter, representing 4.6% growth year-over-year. For the following quarter, analysts expect sales to come in at $1.23 billion; down sequentially but up about 6.6% year-over-year -- representing an acceleration in year-over-year growth. NVIDIA didn't issue a revenue warning or a positive pre-announcement, so it's a safe bet that the company will report revenue within its guided range of $1.3 billion give-or-take 2%. Where the macroeconomic softness could potentially impact the company is in the guidance that it issues for the following quarter. On one hand, it's not unreasonable to believe that in times of macroeconomic uncertainty, fewer customers are going to be interested in shelling out big bucks for NVIDIA's gaming-focused add-in boards and/or (fairly expensive) personal computers equipped with such boards. Indeed, digging through NVIDIA's form 10-K filed in early calendar 2009, the company attributed its full year revenue decline to, among other factors, the "overall global economic climate." The company, though much more resilient and competitive than it was all of those years ago, is still likely to suffer if the macroeconomic environment deteriorates. That being said, even though PC chip giant Intel (NASDAQ:INTC) has become a bit more cautious on the overall PC demand environment (no doubt influenced by macroeconomic concerns), the company did still report record Core i7 and gaming-oriented "K" series desktop processors. This seems to suggest that even though overall PC sales might be vulnerable, the sub-segment that NVIDIA serves (i.e. high performance gaming PCs) may hold up fairly well. The main thing that should drive the stock in the near-term will be the outlook that the company issues and the commentary that surrounds that outlook. If the company continues to see strength in its core gaming graphics processor business even in the face of a weakening macroeconomic environment, then that could very well help reverse the downward slide in the company's stock price seen year-to-date. However, if NVIDIA guides substantially lower-than-expected as a result of a macro-related slowdown, then I wouldn't be surprised to see NVIDIA shares (as well as shares of many of its semiconductor peers) move lower from here. The silver lining in the latter case, though, would be that NVIDIA has the wherewithal to continue to invest even in a fairly prolonged period of macroeconomic/revenue weakness by virtue of its fortress of a balance sheet. Should the macroeconomic situation get quite bad, this is a company and, ultimately, a stock that I'd be interested in riding the eventual recovery up on.